“You Live Here Too” This will be a multimedia performance by Julia Vering, utilizing video, stop-motion animation, an original score, and local senior citizens as actors and oral historians. The project will push the boundaries of storytelling through experimentation. You Live Here Too will be filmed and performed in local nursing homes, senior centers and the library, breaking down generational boundaries through symbolic and literal sharing of space. Scripts will be provided to actors, but they will also be encouraged to improvise and to infuse their own personal histories into the story. The project will engage a marginalized community that is often cut off from contemporary art, in the comfort of their own homes and recreational sites. It will serve as a model for therapeutic recreation with seniors. The story begins as a young mannequin, played by the artist, sits down in her living room at home to watch a self-help video purchased at a thrift store. The video features a data entry specialist who asks the mannequin questions regarding her purchases for the day, her childhood, her virtues and her character, culminating in a discussion of what it means to be human. You Live Here Too examines the ways in which we construct identities and meaning through storytelling, congregated living and age-segregated recreation. Blurring truth and fiction through an absurd framework, participants will be given the opportunity to both become someone else, in the way that drama allows, and also reveal their true character through the sharing of personal histories. The project will culminate in a cohesive story that blends identities while showcasing images of aging women. 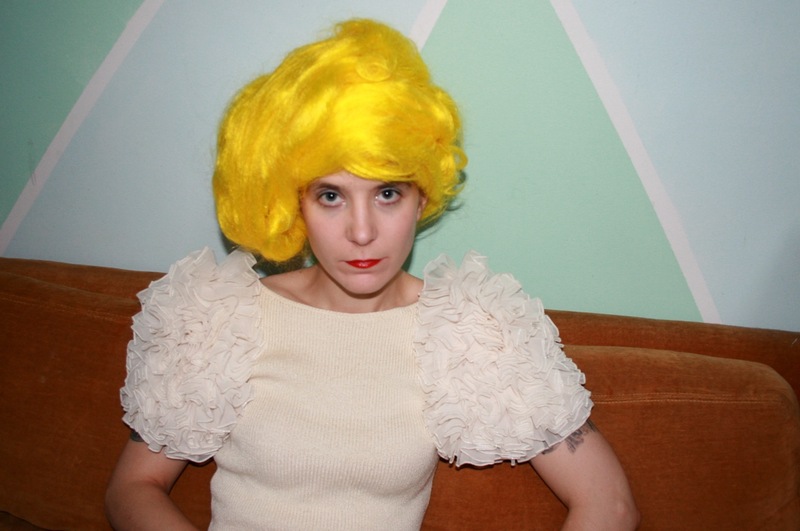 Julia Vering is a performance artist, musician, animator and licensed social worker. She began her involvement with the Kansas City DIY/punk scene as a teenager taking photographs and creating zines about obsolete local amusement parks and punk bands. She attended the Evergreen State College where she earned a B.A. in liberal arts studying electronic music, experimental animation and social work. While in Washington state she formed and toured with the all female conceptual art band Muñeca Chueca, volunteered at a senior center, recorded oral histories, and facilitated music recording workshops for incarcerated youth. After graduation she moved back to Kansas City and began working at a nursing home where she facilitated art and music therapy and began an experimental drama program. She studied electro-acoustical composition and gerontology at the University of Missouri Kansas City. She earned a Masters degree in Social Work from the University of Kansas. She designed a recreational therapy program for the inpatient geriatric psychiatric unit at the Kansas City Veterans Affairs Medical Center and currently works as a licensed social worker at Kansas City Presbyterian Manor facilitating a drama club, harmonica band and talent shows. She seeks to balance her propensity towards advocating for the rights of others and building strong interpersonal relationships with the nursing home residents she works with professionally with the need to create intensely personal introverted work to share with the public; to reconcile her aptitude for listening to and fostering a sense of being understood in others with the longing to be understood herself. Her work explores mortality, loneliness, absurdity and empathy, seeking to monumentalize the ostensibly mundane and forgotten through sound, performance and visual art. Recent projects include The Aviator, a one-woman operatic biographic portrait of a delusional former TWA employee performed locally and nationally in 2008, Undermined: A documentary of the personal histories of the Argentine Mine in Paintings, Photographs, Words, Sound and Video exhibited as a solo show a the 6th Street Gallery YWCA in 2009, Essentially You, a one-woman multimedia performance about a conversation between a naked mannequin and paraprofessional personal shopper performed at Grand Arts in 2010, and BEAUTYQUEST, a collaborative multimedia science fiction operetta performed at C.A.T.A and the Fahrenheit Valentine Ball in 2011. Vering has also performed and exhibited work at The Paragraph Gallery, The Next Space, The Hassle Castle, Excalibur Club, AJS Memorial Hall, La Esquina, The Kansas City Kansas Film Festival, and nationally at Gallery 1512 in Seattle, The Evergreen State College in Olympia, WA, Rocket Projects in Miami, and the Queer Film festival in Seattle. She often uses the name Unicorns in the Snow and has released recordings, including The Geriatric Pony Express on Aphonia Records. She is scheduled to perform at Weirdstock Festival at the Cambridge Massachusetts YMCA and release the album The Aviator in 2011. Julia Vering continues to work within the DIY ethos recording her own music, filming, editing her own videos and writing her own scripts at her home studio in Kansas City, Kansas.